Do I need a service call? Garage doors and garage door openers have many moving parts and like any other mechanical or electronic products they can break down. Garage door springs act as a counterbalance to the weight of a door and are the means whereby a door opens or closes as the spring winds or unwinds. Springs are the most likely component to break on residential or commercial garage doors and when this happens the door will either not open or be stuck in the closed position. It may just be that the spring has lost its tension or that it has reached the end of its life cycle and has snapped. Either way it will be necessary to call an experienced door technician to correct the problem. Garage door springs are under tremendous torque so homeowners should never attempt to tension or replace the springs on their garage door as serious injury could result. Typically, residential springs have a life of 10,000 cycles and hi-cycle commercial doors average 100,000 cycles. A cycle occurs when a door is opened and shuts again and it is possible to purchase springs with higher cycles for both residential and commercial applications. The diameter and length will determine the life cycle of a spring. Single residential garage doors generally have one spring and double garage doors will have two springs whereas commercial doors may have as many as four different springs. If there is more than one spring on a door and it breaks then it is prudent to replace the other springs since they too will break in the near future..
Cables are the next most likely item to break on a garage door as over time they can fray or snap. These cables will be found on either side of the door and run from the cable drums at the top of the door down to the bracket at the bottom of the door. 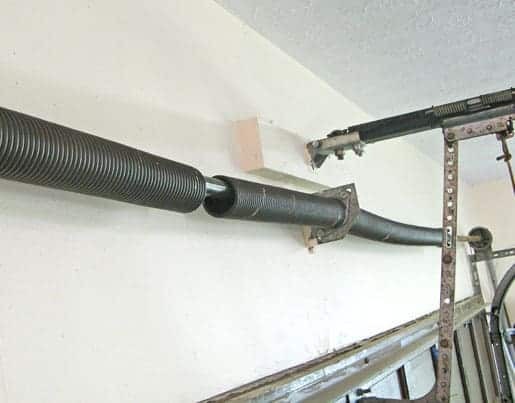 As a garage door spring winds or unwinds so the cables lift or close a garage door. Should a cable snap or start fraying again it will be necessary to have an experienced garage door technician attend to the repair and homeowners should never attempt to do this themselves. Other components that may result in a need for a service call are moving parts such as the rollers that run within the door track and the hinges that connect the different door sections. Modern garage door openers or electric openers are sophisticated electronic devices that are installed to activate the opening or closing of garage doors and do not per se do the actual heavy lifting as that is the job of the springs and cables described above. As with any electronic device there are a myriad of reasons why openers may break down. They have circuit boards that may stop working as a result of an electrical spike or lightning strike, or a chain or belt may snap, or a gear and sprocket may be worn and all these will necessitate a service call. A very common cause of an opener not working is when the electronic photo eyes, that are installed on either side of the door, are accidentally bumped out of alignment. This can be rectified simply by realigning the eyes but even this can be tricky to do and could result in a service call. Many homeowners have their garage doors serviced professionally at least annually during which time an experienced technician will check the spring balance and inspect and lubricate all moving parts. After all an ounce of prevention is worth a pound of cure.